This section includes a survey to determine students' perceptions about tobacco, their understanding of its effects, and their experience with it. In addition, it includes activities to educate students about the health consequences of tobacco use. Young people often feel invincible. They may think tobacco causes health problems for adults, but that those same health risks won’t apply to them. According to the CDC, “many children and adolescents do not understand the nature of tobacco addiction and are unaware of or underestimate the important health consequences of tobacco use.5 Therefore, they need to be reminded that health consequences of tobacco use affect everyone. This activity outlines and explains some of the health consequences caused by cigarettes and smokeless tobacco. Knowing the facts may prevent students from experimenting or stop them if they’ve already tried tobacco. The CDC reports each year that more deaths are caused by tobacco use than by all deaths from motor vehicle injuries, illegal drug use, alcohol use, human immunodeficiency virus (HIV), suicides, and murders combined.7 Share this statistic with your students. Ask your health teacher or school nurse to join you for this activity. Have a dictionary or health textbook on hand so students can look up unfamiliar terms and share them with the class. Ask the students to review the list. Use the Internet (www.cdc.gov/tobacco) to define any unfamiliar terms. Then, ask students which issues on the board they believe are health consequences of tobacco use. Check each one the students suggest. Next, tell them that all of the items on the list are health consequences of tobacco use—and they are real. Some students might be concerned about consequences such as bad breath and the smell, while others may be more concerned about the diseases. Share the activity link with your class or open the activity on your interactive whiteboard. Click the thumbnail below for the link. Then, review the information provided in the activity. After students complete the activity, take a class poll to see which of the health consequences students were familiar with and which ones they were not. They may be surprised to learn how quickly a young person can be affected by using tobacco. 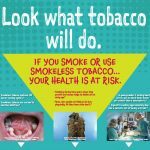 Before completing this activity, display the health consequences poster, “Look What Tobacco Will Do.” It is included in the “Materials” section below. Read the facts with your students. Remind them that these are real issues that affect people who use tobacco. Deciding to be tobacco free will help them stay healthy. As a class, visit the CDC’s website for additional information on health consequences. Use the supplemental “Totally Caught” video, in the “Materials” section below, to complement this section. Students will discover this fact at the completion of Activity Two: Cigarette smoking is responsible for about one in five deaths in the U.S. per year.7 Have students work in teams to research this fact and prepare presentations or reports to encourage people to be tobacco free. Along with their presentations or reports, have students create a digital poster representing what they’ve learned about tobacco and its health consequences. The materials for the digital poster are provided below. To create their presentations or reports, students might use photos or images, Internet resources, books, or interviews with smokers who quit as their resources, along with their digital posters. They will then create a slideshow, handouts for their peers, or any presentation method of their choice to accompany their digital posters and demonstrate the health consequences of tobacco use that generate the statistic above. Determine a timeframe that is appropriate for your group. Let students get creative and use whatever aids they find most effective to do their reports/presentations. Schedule each pair/group for a different day during the unit to present its findings so your students have enough time to prepare their projects. Invite other classes in to see the presentations. For additional information on factors that influence young people to either abstain from or experiment with tobacco, review the Overview Booklet.